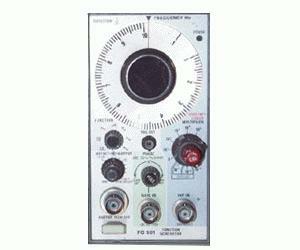 The Tektronix FG501 is a general-purpose, low frequency function generator producing low distortion sine,square,triangle,pulse, and ramp waveforms.Frequency is selectable from .001 to 1 MHz (switched in decade steps). An external VCF input permits controlling the output frequency from external voltage source.Frequency sweep up to 1000:1 ratio may be accomplished by applying a voltage ramp to the VCF input. Output amplitudes of 15 Vp-p open circuit and 7.5 V into 50-ohms can be obtained.